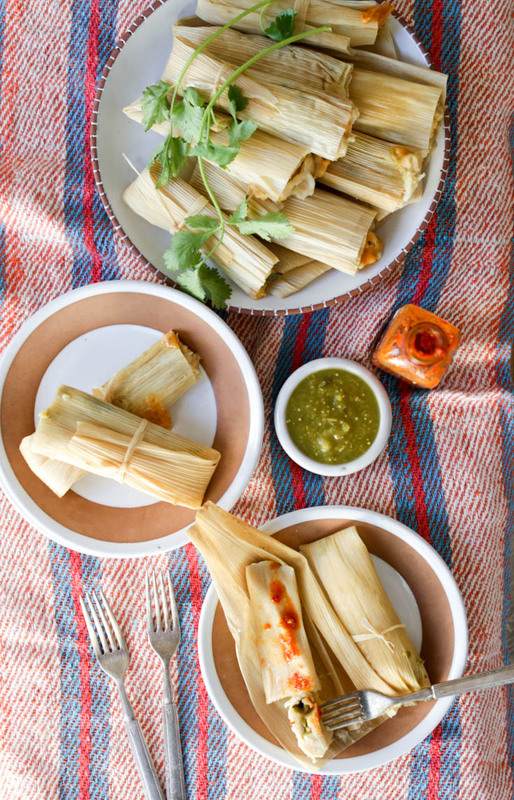 My favorite tamales are filled with roasted chiles and cheese — tamales de rajas con queso. Whenever the “tamale lady” would stop by my old job, I’d buy a dozen and eat half of them before lunch break even came around. They were still hot because she carried them in a cooler, wrapped up in fat foil bundles. The hot hot hot salsa that she gave away in tiny baggies (I figured out that salsa recipe here) smeared on every one. Filled to bursting with soft cheese and roasted chiles. Oof. I’m sure that hers weren’t vegetarian tamales — I’m positive they were made with lard — but for this recipe, since it’s dedicated to my friend Adriene who is vegetarian, I’m using butter. Oil works, too, but butter adds more flavor. If you prefer to use lard, go right ahead! Let it soften on the counter before you whip it. I’m also using vegetable broth (I like this brand) but chicken broth works deliciously. For the cheese, I’ve made these tamales with Oaxacan cheese, Monterey Jack and Manchego. I think you could use any kind of melting cheese you want (a smoked cheddar or gouda would be interesting) as long as you’re generous with it! Roasted poblanos are perfect but I’ve also used roasted Hatch chiles in the past. And the salsa verde – make a batch of my recipe or just buy a jar of your favorite. Serve any extra along with the tamales. Tamales are a Christmas Eve tradition in my family and in many Texas families. We always had them with rice and refried beans and my grandma’s queso and chips. And Tapatio hot sauce and beers. Tiny glasses of Rompope for dessert after. One present each for the children to open after dinner then off to bed while the adults stayed up late with the Rompope. Watch the Tamales How-To Video on YouTube! Begin soaking the husks in hot water. Get a large pot, put a penny in the bottom and a steamer basket or tray. Mix masa harina with 2 cups of broth. Add more if necessary to get it fully dampened. Let sit 5-15 minutes. Meanwhile, beat the butter, oil, and salt together on medium speed until smooth; about 3 minutes. Add the masa a bit at a time until it’s incorporated. Add more broth if necessary. Beat until smooth and soft, about the appearance and texture of hummus. Test it by dropping a small spoonful into a glass of water. The ball should float when the masa has the right amount of air whipped into it. Cover and set aside while you roast the peppers. Place them under the broiler or over a gas stove until blistered all over. Transfer to a bowl and cover. Let cool. This steaming allows you to remove the skin better. Peel and cut them into strips. Cut the cheese into strips. Add water to the large pot, just up to the bottom of the steamer rack. Layer soaked husks (can be the ugly ones) all over the bottom and up the sides. Turn the heat to low and put a lid on the pot. Spread a tablespoon of salsa over that, then a couple strips of poblano and cheese. Fold the right side over, left side over, bottom up. Tie with a strip of husk if necessary. When all tamales are made, place then in the pot. Cover and increase heat to medium. You should hear the penny jingling. If it stops, you need to add more hot water. Pour it in along the side of the pot, not on top of the the tamales. Let them steam for 60-80 minutes, until firm. To check doneness, pull one out and let it cool a few minutes. 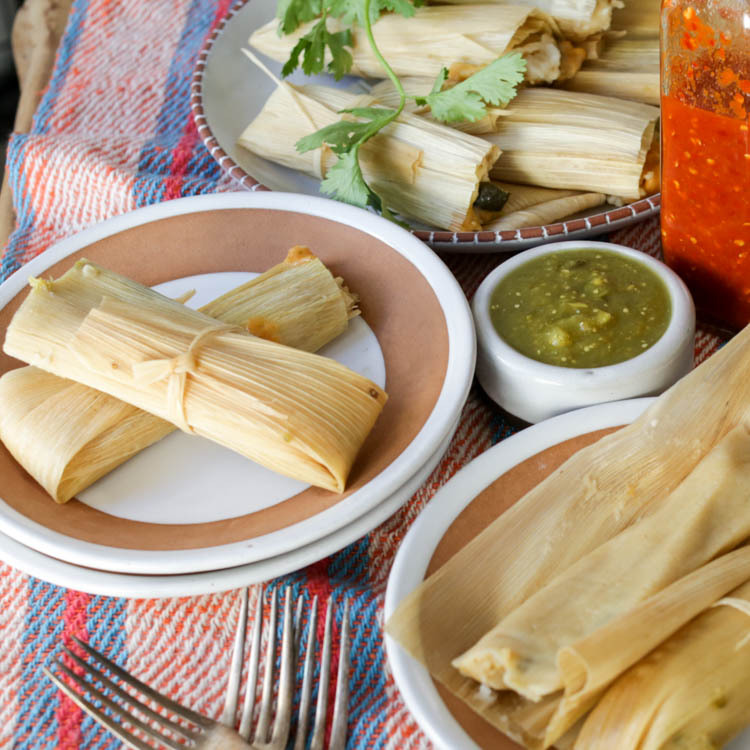 If after that, it unwraps easily without sticking – the tamales are done! Oh my goodness! I have never thought to whip the masa! I stopped making tamales because I couldn’t figure out a decent way to make vegetarian masa. (Is whipping it standard? It seems so obvious, but I always used a wooden spoon.) I was contemplating using cream cheese, like you did for your empanadas, but I will have to try this first! Thanks for another amazing recipe. I hope it turns out as good when I make it as yours look! Definitely try butter tamales, Katricia! I think you could get similar results from hand-beating the masa but it would be a work out 😉 Enjoy! Can the Tamales be made without butter? If so, how much oil? I haven’t made tamales with oil myself, but I know other people who do it that way. I think 3/4 cup would still be the correct amount. I helped make tamales in my first husbands family tamale business in Houston Texas. 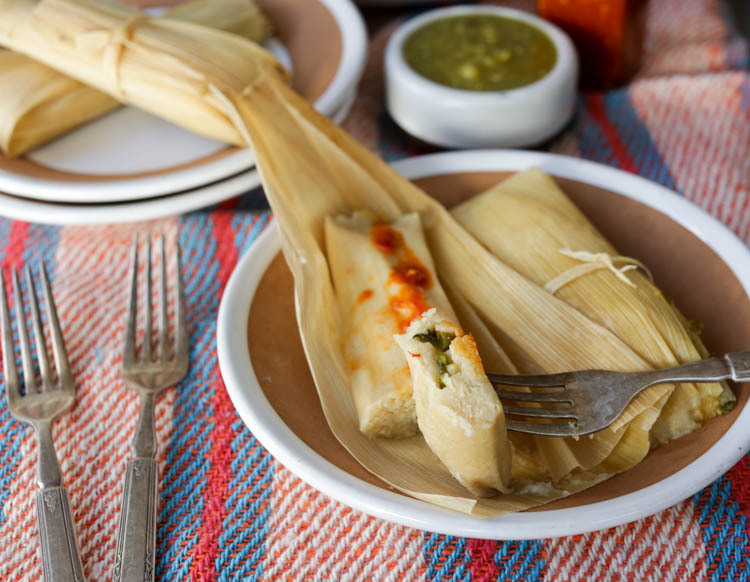 We made authentic tamales but once we ran a little short of lard and could not get any that day and we used vegetable shortening instead measure for measure. If they were good, they were good! That’s what counts. I’m so happy you tried making your own tamales, Amber 😀 You should be really proud of yourself! These look perfect! I am going to make the tamales this weekend. What are your thoughts on making a double or triple batch and freezing them for another time? Before or after cooking? Thanks so much! I love your recipes and videos.! Hello Hilah, These look perfect! I am going to make the tamales this weekend. What are your thoughts on making a double or triple batch and freezing them for another time? Before or after cooking? You can definitely freeze after steaming, then just cool and wrap tightly in foil (keep the husks on). To reheat, a microwave works great — cover with a damp towel and heat for 2-3 minutes. Or you can steam them again if you don’t have a microwave. Do not thaw before reheating. I made these for my husband last week to remember his moms cooking. (She passed away a year ago). He loved them! Great tutorial video. I found that using a flexible pastry scraper to spread the masa made it a lot easier than the lumpy back of a spoon. I also used the instapot to steam the tamales. Just set the steamer basket over 2 cups of water. Pressure cook for 19 minutes and allow a natural release. Let the tamales cool a little and they are great! Cuts a lot of time out of the process. Thanks, Michelle! That makes a huge difference and so many people have instant pots now. Glad y’all enjoyed the tamales! Thank you for your honest outbursts when in the kitchen. Watching you cook always makes me laugh out loud when you struggle with a recipe just like the rest of us in our own kitchen. And, these turned out awesome! Thx! thank you for the recipe!! Question what to do if you masa doesn’t float. I beat it forever! I’ve not had that happen. Are you beating by hand or with a mixer? You can still use the masa, though. The tamales might not be as soft, but they will be good.